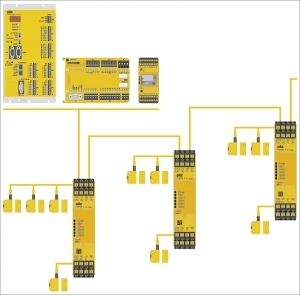 Pilz Automation Technology has launched Decentralised Periphery PDP20 – meeting PLe for series connected switches. The new interface module PDP20 F 4 mag is suitable for series connection of safety switches, such as tongue interlocks or magnetic safety switches, up to PL e.
As such, it provides a standard-compliant solution in accordance with EN ISO 13849-1. The interface module can be connected to dual-channel evaluation devices (such as the popular PNOZ safety relays, PNOZmulti configurable safety relays, PSS safety PLCs). Up to four switches can be connected to each PDP20 module. PDP20 interface modules also offer a high level of decentralisation due to the ability to cascade modules. Each module features four dual-channel inputs and 2 solid-state safe outputs (OSSDs), 1 diagnostic solid state output and 2 test pulsed outputs. To cascade multiple PDP20 modules, the OSSDs of one are fed into one of one of the dual-channel inputs of the next PDP20 module. Costing less than a standard safety relay, PDP20 interface modules makes a compact and economical solution for series connections, which ultimately find their way back to a final safety relay or other safety controller.